elli & nels *in stitches*: *cough*bragging*cough* I mean, a pattern review! Okay, seeing as how I have no clue how to sew, and even though I would love to learn someday, that opportunity is not even close to being in the near future as far as I can tell, so the topic really doesn't even interest me much, I LOVE READING what you write. You make it so....funny...somehow! 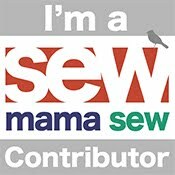 Would love to teach you how to sew someday! !